Sometimes your squad will make contact with a hostile element that it just can’t effectively fight. This could be due to many factors – numbers, strength, or terrain to name a few. In cases like these you have two options: fight or flight. Fighting would probably not be a great idea, you’d lose most if not all of your squad and ultimately lose the engagement. Fleeing is another option and while I refrain from using that word, leaving the immediate engagement area may seem like retreating to others but perhaps you are just leaving temporarily or repositioning your squad on more advantageous terrain or in a way that allow for easier friendly reinforcements – there are a lot of dynamics at work. This article will explain effective and battle-tested measures for properly breaking contact. Break Contact is employed after the squad has completed the React to Contact battle drill. At this point in time, a portion of the squad is established in a base of fire against the enemy contact, the other portion of the squad is to the rear and ready for orders. 1. 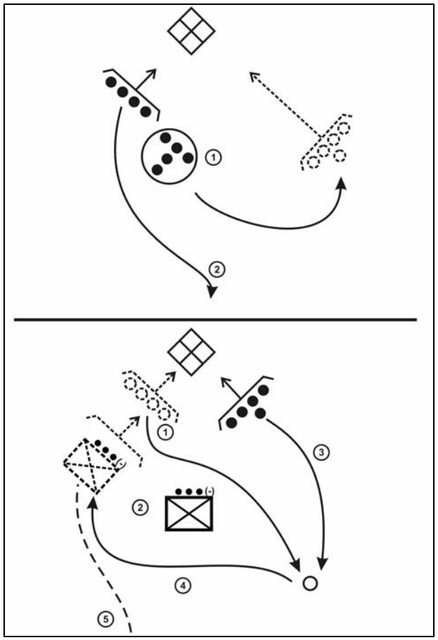 The squad leader orders the rear element to establish a base of fire against the enemy contact that allows them freedom of fire against the enemy without a chance of killing the forward element of the squad that established the forward base of fire. 2. The rear element puts fire down on the enemy in order to suppress the enemy and cover the forward element. 3. The forward element puts down an extreme amount of fire, emptying their weapons into the enemy’s positions. Grenades and grenade launchers offer excellent suppression for this purpose. 4. The forward element moves backwards (bounding) at least as far as the rear element, or further – situation dictating. 5. The forward element re-establishes a base of fire and begins suppressing the enemy. 6. The rear element puts down an extreme amount of fire, emptying their weapons into the enemy’s positions. Grenades and grenade launchers offer excellent suppression for this purpose. 7. The rear element moves backwards (bounding) at least as far as the forward element, or further – situation dictating. 8. Continue steps 3 through 7 until the entire squad is no longer taking fire from the enemy.